The fool worries thinking “I have sons, I have wealth”. Indeed, when he himself is not his own, whence are sons, whence is wealth? ~ Dhammapada 62. Theravada in the USA is multifaceted. It is quite likely that among the native Americans, Theravada’s most popular form comes as the Vipassana meditation groups which have established countless centers throughout the country. The traditional monastic form is far less common but nevertheless, is gaining popularity. Dhammaduta bhikkhus from traditional Theravada countries of South East Asia including Laos and Cambodia, have established several viharas. Of these, the fastest growing and most numerous is undoubtedly the Thai was which are scattered across the country and in such unlikely places as Alaska, Hawaii and North Carolina in the heart of the Bible Belt. As recently as 1978 there were only five Thai temples in the whole of the USA. In 2002 there are more than eighty five and more are being planned. Among the better known early viharas is the beautiful Wat Thai of Los Angeles set in 2.2 acres of gardens donated by a wealthy man in Bangkok, Wat Thai of Washington DC, Vajiradhammapadip temple of New York, Wat Buddhawawaram of Denver and Wat Dhammaram of Chicago. In 1965 the Sri Lankans established the Washington Buddhist Vihara, likely the first Theravada vihara in the US. The viharas established by the Sri Lankans may be less numerous but appear to be more successful in teaching the Dhamma to native Americans. The Los Angeles Buddhist Vihara was established in the early 70’s. In 1978, Ven. Walpola Piyananda took became the chief incumbent. In the following year, it arranged the bhikkhu ordination of Ven. Yogavacara Rahula, a Californian who had taken samanera ordination in Sri Lanka ten years earlier. In addition to ministering to the westerners, the bhikkhus also served the immigrant Asian communities from Laos and Cambodia. However, in 1979, as a result of unresolved differences with the then management committee, Ven. Piyananda left and established the Dhamma Vijaya Buddhist Vihara also in Los Angeles in 1982. Here, he continued his dhammaduta activities with great success in close cooperation with other Buddhist organizations in California. In 1988 bhikkhus from this vihara founded the Houston Buddhist Vihara in Texas. The first Burmese mission to the US was in 1978 upon the invitation of a remarkable woman Rina Sircar, who became a teacher in her own right. Born to Indian parents in Myanmar, she left the country when the Burmese government nationalized their family business. She later won her Doctorate in Buddhist Philosophy and became Director of Buddhist Studies at the University of California. After returning in 1977 for a meditation course with the forest master Taungpulu Sayadaw, she returned to the USA and planned to invite the master to establish a center here. They found a suitable place in Boulder Creek near San Francisco and here the Taungpulu Kaya Abe Monastery was established. In the same year the luminary bhikkhu Mahasi Sayadaw also toured the USA along with Ven. Silananda, Ven. Janaka of the famous Chamyay Yeiktha in Myanmar, Ven. 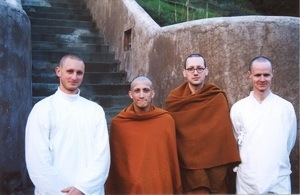 Kelassa and other bhikkhus. This dhammaduta tour was extremely successful with retreats and teachings given along the west coast and then in Washington DC and in Massachusetts. When he later left for the United Kingdom, Ven. Silananda and Ven. Kelassa remained behind. These two bhikkhus then went on to establish Dhammananda Vihara in California and Mangalarama Vihara in Maryland, respectively. Another major monastery on sixteen acres of land was established in Austin, Texas in 1992 by the deeply respected Sitagu Sayadaw of Sagaing Hills, Myanmar. The monasteries established by the Asians have naturally been mainly supported by the ethnic Asian communities. They also have had moderate success in propagating the Dhamma to westerners resulting in a small number seeking bhikkhu ordination, either at the viharas themselves or in Asia. However, viharas where westerners are predominant have only been a recent addition to the milieu. In 1968 the Sri Lankan bhikkhu, Ven. Gunaratana arrived in USA from Malaysia and took up residency at the Washington Buddhist Vihara. Since then, he had been traveling giving Dhamma talks in universities, colleges, schools, and various organizations. In 1982, he formed Bhavana Society and with a close student set about to look for suitable land to establish a forest meditation retreat. After a long series of difficulties, they finally found and purchased a 13-acre piece of land, in the beautiful Shenandoah valley in West Virginia and put up the first building in 1985. Subsequently, donors purchased neighboring land and expanded the property to thirty-two acres. In 1987, the Californian Ven. Yogavacara Rahula came to spend two weeks at the monastery and decided to stay. Since then, it has become a home for several American monks and nuns. In 1990 Metta Forest Monastery was established in a 60-acre avocado grove located on a hill surrounded by chaparral, with Indian land on two sides and a spectacular view of Mt. Palomar to the east. Although just north of the Mexican border near San Diego the air is clean and smells of wild rosemary and sage, the land is still relatively wild, with coyotes, an occasional fox and deer and rattlesnakes. The community is a mixture of American, Thai and Laotian Buddhists. The monastery was started by Ven. Ajahn Suwat Suvaco, a Thai monk with 50 years in the robes. He has lived in the USA for the last ten years, but for the 40 years before that he spent most of his time training in the forests of Thailand under some of the most respected teachers of the Thai forest tradition. An American monk, Thanissaro Bhikkhu (Geoffrey DeGraff), who trained for 14 years within the forest tradition in Thailand returned to help in 1991 and was made the abbot in 1993. Ven. Thanissaro is respected among the community of western bhikkhus as a scholar of Vinaya and the suttas. He was a student of the Thai master Ajahn Fuang Jotiko. In 1990, Ajahn Amaro (Jeremy Horner) from Amaravati Monastery in the United Kingdom visited the USA to teach at various Buddhist communities. Over the next few years he periodically returned to teach at venues such as The City of Ten Thousand Buddhas, Green Gulch Zen Centre, Esalen Institute, various vipassana centers and Thai temples eventually building up a group of supporters who organized themselves as the Sanghapala Group. Ajahn Amaro was born in Kent, UK and had ordained at Wat Pah Nanachat in N.E. Thailand under the Thai master Ajahn Chah in 1979. Two years later, he joined and trained with Ajahn Sumedho in the UK. In 1995, dhammaduta effort in the USA was intensified with Ajahn Amaro and three other bhikkhus spending the vassa in tents at Bell Springs Hermitage north of San Francisco. The rural retreat, at a height of 3,800 feet commanded spectacular views in all directions and sometimes would be covered with fog rolling in from the nearby Pacific Ocean. Just before the start of the vassa, the abbot of The City of Ten Thousand Buddhas, the Chinese Mahayana monk Ven. Hsuan Hua passed away. Since the early 90’s, he had cultivated a close friendship with Ajahn Sumedho, the abbot of Amaravati with monks from both monasteries visiting each other. Just before the Ven. Hsuan Hua passed away, he had generously gifted 120 acres of wooded land near the City of Ten Thousand Buddhas to the sangha of Ajahn Sumedho. The land, 120 miles north of San Francisco is in a beautiful, unspoilt, bowl-shaped valley, frequented by deer and other wildlife. The new monastery was named Abhayagiri, after the ancient monastery in Sri Lanka where Theravada and Mahayana monks once lived together. In early 1997, Ajahn Passano (Reed Perry), the Canadian abbot of Wat Pah Nanachat in Thailand joined Ajahn Amaro as co-abbot. The first bhikkhu ordination in Abhayagiri took place on Vesak 1998 with the ordination of the American samanera Karunadhammo. In August 2005, two bhikkhunis, Tathaaloka and Sucinta spent their vassa at Dhammadharini, the first bhikkhuni vihara in the USA. Thai Buddhism in the Buddhist World, Phra Rajavaramuni. Mahachulalongkorn Alumni Association, 1984. Dhamma Vijaya. Newsletter of Dhamma Vijaya Buddhist Vihara. Article by U Ko Lay in the Souvenier publication of The International Theravada Buddhist Missionary University, 1998. 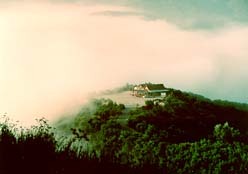 Photo 1: Metta Forest Monastery in the mist-shrouded hills near San Diego. Photo 2: Kuti in Bhavana Society’s monastery, West Virginia. Photo 3: Monks and anagarikas (postulants) at Abhayagiri, California.